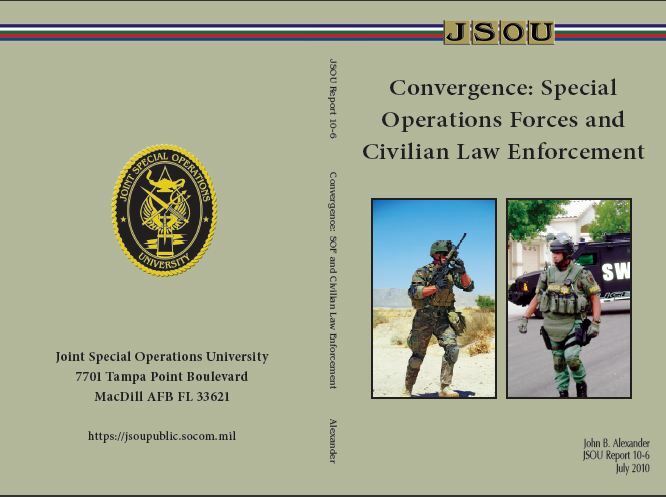 Excerpts from Convergence: Special Operations Forces and Civilian Law Enforcement. Of concern to law enforcement is the sophistication of many of these gangs. The old motorcycle gangs, such as the Outlaws and Hells Angels, are alive and well, but have learned to stay below the radar of police agencies. Instead they are entering the business world in both white and gray enterprises. Working in white collar crime is less conspicuous, and members who cross the line and attract attention may face severe penalties. The rule is, “Do not irritate law enforcement.” 115 However, as the cartel gangs become more active, it is highly likely that friction will occur between them and the older, more established gangs. a. 18th Street Gang—30,000 to 50,000 members in the U.S.
p. Vice Lord Nation—30,000 to 35,000 members. the Government may approve use of the military in ways rarely thought about. Should such a situation arise, SOF elements would likely be engaged. RAMSTEIN AIR BASE, Germany – Losing a child is like somebody stabbing you in the heart with an ice pick and leaving it in just so they can apply pressure. The ice pick is never ripped out of your heart, just constantly ripped at. That’s how Stephanie Cockrell, the mother of a soldier beaten to death by fellow troops during a 2005 gang initiation, described the feeling of life without her only child, Army Sgt. Juwan Johnson. During a court-martial last week for Airman Nicholas Sims, Cockrell told the court she is not proud her son joined a gang hours before his death on July 4, 2005. She wonders how she’ll tell her grandson about the identity of the father he will never meet. The 28-year-old Sims — who has been in pretrial confinement for 162 days — was sentenced Friday to eight years’ confinement, dishonorable discharge and reduction to the lowest rank for his role in Johnson’s death. However, Sims will serve no more than six years’ jail time because of a pretrial agreement and credit for time already served. On Wednesday, Sims pleaded guilty to involuntary manslaughter, disobeying an order by being a gang member and distribution of marijuana and Ecstasy. On July 3, 2005, Sims was one of at least six Gangster Disciples who beat Johnson for six minutes during a gang initiation near Kaiserslautern, according to testimony. Two soldiers were convicted last year for their part in Johnson’s death. They were sentenced to 12 years’ and six years’ of confinement, respectively. A third soldier tried in 2007 was acquitted. Sims’ court-martial, which initially was set to begin Monday, started Wednesday afternoon. During roughly four hours of questioning Wednesday from the military judge, Air Force Col. Gordon Hammock, Sims detailed his participation in Johnson’s initiation. Hammock repeatedly sought to determine why things got so out of hand on July 3, 2005. Sims, who trained as a boxer in his youth in Queens, N.Y., was asked several questions by Hammock about the ferocity of Johnson’s beating. Sims’ reply underscored the severity of what the 5-foot-3 Johnson went through. “I don’t see how anybody could have made it out of that,” Sims said. On Thursday evening, Cockrell took the stand to deliver testimony that captivated the courtroom and brought Sims to tears. Cockrell talked of raising Johnson as a single mother in Baltimore. At times, the former drug addict and current counselor had courtroom spectators laughing. At times, Cockrell had the gallery crying. At times, Cockrell broke down. The gang, in which Sims said he served as the second-highest-ranking member, fashioned itself as a family that would do anything for its members. Cockrell wondered where those family values were when gang members continued to punch and kick her son, even after he fell and could no longer stand during his initiation, she said. Just like the other convicted gang members, Sims expressed regret for his actions on July 3, 2005, and what happened to Johnson. Cockrell wasn’t buying it Thursday night. Twice Cockrell was asked if she had anything else she would like to say to the judge, Sims or the court. She turned to Sims and then the judge. In an intensely emotional moment, Cockrell addressed Sims a final time. Sims quietly wept in his chair for minutes afterward. © 2007 Stars and Stripes. All Rights Reserved. “MEXICO CITY (Reuters) – Mexican soldiers battling a violent drug gang and corrupt local police confiscated a sport utility vehicle decked out with extras worthy of a James Bond movie. Cartel members rammed their SUV into a military truck patrolling in the state of Tamaulipas and threw a hand grenade before making their escape with the help of local police, the army said in a statement late Tuesday. OK, so the Mexican government recognizes the problem . . . military-style equipment in the hands of gang members . . . who rammed their SUV into a military truck patrolling in the state of Tamaulipas and threw a hand grenade before making their escape with the help of local police. I think it’s time U.S. law enforcement sees this in the “not if, but when” category. Our military gang bangers commit murder, armed robbery, and home invasion, in addition to the drug trafficking, of course. If we don’t recruit them, and proactively regulate those who are in, we may avoid what our neighbors to the south have not . . .
Let’s start playing like it’s not a game . . .